The Battle of Kosovo (Serbian Cyrillic: Косовски бој or Бој на Косову was fought on St Vitus' Day (June 15, now celebrated on June 28) 1389 between the coalition of Christian Serb lords and the Ottoman Empire. Reliable historical accounts of this battle are scarce, however a critical examination of them and comparison with similar contemporary battles (such as the Battle of Angora or Nikopolis) enables for a reliable reconstruction. The battle saw the end of the medieval Serbian kingdom, and the start of more than four centuries of Ottoman rule. The medieval Serbian kingdom, which at times controlled parts of Bosnia, dates from the seventh century. When the possibility not only of gaining independence from the Ottomans but also of regaining its ancient prestige as a local power became thinkable, the battle of Kosovo became a dominant motif in patriotic Serbian literature. Prince Lazar, the slaughtered Serb leader, took on a Christ-type persona that pitted him against the Ottomans as Christ-slayers. Slavs who became Muslim were subsequently regarded as race-traitors and as equally guilty of murdering Lazar. On the eve of the Bosnian War and of the Kosovo crises following the breakup of Yugoslavia in 1990, Serbian President Slobodan Milošević used the six–hundredth anniversary of Kosovo to announce that new battles that faced the Serbian people could not "be won without resolve, bravery, and sacrifice, without the noble qualities that were present here in the field of Kosovo in the days past." During the subsequent war, Miloševic was himself depicted in posters side by side with Prince Lazar and Jesus, "in a kind of holy trinity." Ottoman Emperor Murad I had been expanding his territory into the Balkans, compensating for loss of Muslim territory in Spain. Various Serbian nobles, however, had enjoyed some success in defending their territory against the Ottomans. Determined to conquer the Balkans, Murad gathered his troops in Philippoupolis (Plovdiv) in the spring of 1389, and arrived in Ihtiman (Bulgaria) after a three-day long march. From there, he chose the route across Velbužd (Kyustendil) and Kratovo. Though longer than the alternative route across Sofia and the Nišava valley which would give him direct acces to Lazar's lands, it led him to Kosovo, which was strategically significant as one of the most importand trade crossroads on the Balkans: from Kosovo Murad could attack either the lands of Lazar or Vuk Branković. Lazar and Vuk were two of the most powerful of Serbia's ruling nobility. After staying in Kratovo for a while Murad passed across Kumanovo, Preševo and Gnjilane to Priština, where he arrived on June 14. There is less information available about Lazar's preparations but it could be assumed that he gathered his troops near Niš, possibly on the right bank of the Južna Morava. He probably stayed there until he learned that Murad had moved to Velbužd, when he too moved, presumably across Prokuplje to Kosovo. Lazar arrived to the Kosovo Field right after Murad's arrival to Priština. This was the optimal choice for the battlefield as it controlled all possible directions that Murad could take. It is not certain how large the armies were, especially as later sources tend to exaggerate their size, increasing them to hundreds of thousands. Murad's army might have numbered 27,000-40,000. Assuming that the 40,000 estimate is correct, it probably included some 5,000 Janissaries, 2,500 of Murad's cavalry guard, 6,000 spahis (cavalry), 20,000 azaps (infantry) and akincis (mounted archers) and 8,000 of his vassals. Based on the estimate of 25,000, some 15,000 were under Lazar's command, 5,000 Vuk's, and the remainder under Vlatko's. Of those, several thousands were cavalry but perhaps only several hundred were clad in full plate armour. Both armies included some foreign troops: the Serbian army included Croatian ban Ivan Paližna with a small number of troops, probably as a part of Bosnian contingent while the Turks were helped by Serbian noble Konstantin Dejanović. This has led some authors to describe the armies as coalitions. The role played by Branković, who withdrew and is considered a traitor, also brings treason into the equation. The armies met at Kosovo Field. The center of the Turkish army was led by Murad, while Bayezid was on the right wing and Yakub on the left. It is believed 1,000 archers were in the first line of the wings, followed by azaps, then by akincis; in the front of the center were janissary, behind whom was Murad, surrounded by his cavalry guard; finally, logistics were in the back, guarded by a small number of troops. The Serbian army had Lazar at the center, Vuk on its right wing and Vlatko on the left. In the front of the Serbian army was cavalry; infantry was in the back. While parallel, the disposition was not symmetric, as the Serbian center overlapped the Turkish. The battle started with Turkish archers shooting at Serbian cavalry, which then moved into attack. They managed to break through the Turkish left wing but they were not as successful against the center and right wings. Even the left wing was forced into retreat but was not actually defeated. Murad's death is disputed to this day. One account says that he was assassinated by Milos Obilic, who made his way into the Turkish camp on the pretext of being a deserter, forced his way into the Sultan's tent and stabbed him with a poisoned dagger. Regardless of how Murad died, the confusion that followed was eventually quelled by Bayezid, the Sultan's son. As revenge for the death of the Sultan, the Ottomans killed many of their prisoners. The Balkans coalition initially gained advantage after their first charge, which heavily damaged the Turkish wing commanded by Jakub Celebi. In the center, the Christian fighters managed to push the Ottoman forces back with only Bayezid's wing holding off the forces commanded by Vlatko Vuković. The Ottomans in a counter attack pushed the Balkan forces back and prevailed later in the day. Due to inadequate reliable historical sources, the result of the battle is not clear. 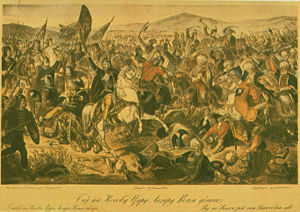 Although the Ottomans managed to push the Serbian forces back, they did not conquer Kosovo immediately after the battle. Instead, due to Sultan Murad's death they returned to Turkey so that the new sultan, Bayezid, could be crowned in the Ottoman capital. On the other hand, some Serbian nobles started paying tribute and supplying soldiers to the Ottomans after the battle, while some did not. Therefore, despite the fact that Serbian myth unambiguously depicts the battle as a defeat, it was not a clear victory or defeat for either side. However, the Ottomans now had the initiative, since the toll on the Serbian side was heavy. By 1459, Serbia was under Ottoman rule and remained so for over 400 years. Both armies sustained heavy casualties and withdrew from the battlefield, but the toll on the Christians, especially on Serbia, was catastrophic as much of their political elite was wiped out. 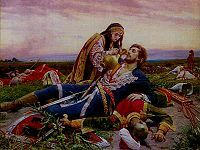 Prince Lazar Hrebeljanović was taken prisoner and executed. It is said that before the Battle Milos Obilic said to Lazar: "For thy goblet I thank you. For thy speech, Tsar Lazar, I thank you not... Tomorrow, in the battle of Kosovo, I will perish fighting for the Christian faith." Later myth represented this as a Last Supper between Lazar and his knights, with Lazar as a Christ-type and his knights representing the Apostles. The Battle of Kosovo represents for many Serbs an important moment in their history. Lazar is widely regarded as a hero, although scholars debate his origin and existence. The Balkan myth not only depicts Lazar as a Christ-type but the Turks as Christ-killers. Those Slavs who later converted to Islam ceased to be Slav, since Slavic identity was so closely associated with Orthodox Christianity that conversion to "any other religion was simultaneously to convert from the Slav to an alien race." By becoming Muslim they also became Turk: Turks, together with all non-Europeans, were considered inferior. the message conveyed by this seminal poetic drama is that the battle between Serbs and Muslims is the battle between good and evil and can only end in the destruction of one or the other, "our battle shall have no end/until we or the Turks are dead to the last man." Both Serbia and Croatia also represented themselves as Christian bulwarks against the threat of Muslim expansion; thus the Muslim presence in the Balkans was "an obstacle that should be removed: a presence discordant with the political growth of Europe and one that interferes with the creation of pure Serbian-Croatian borders." ↑ Milosevic's Speech Kosovo Field, Emperor's Clothes, 1999. Retrieved February 19, 2008. ↑ >Rusmir Mahmutcehajic, The Denial of Bosnia (University Park, PA: The Pennsylvania State University Press, 2000, ISBN 027102030X. ↑ Vojna Enciklopedija, Belgrade: Vojnoizdavački zavod, 1972. ↑ Michael A. Sells, The Bridge Betrayed: Religion and Genocide in Bosnia (Berkeley, CA: The University of California Press, 1998, ISBN 0520216628), 45. ↑ Rusmir Mahmutcehajic, The Denial of Bosnia (University Park, PA: The Pennsylvania State University Press, 2000, ISBN 027102030X), 70. History of "Battle of Kosovo"
This page was last modified on 12 December 2016, at 23:12.